Diplomas "Worked with RCWC members from different countries" ("Heard RCWC members from different countries"). 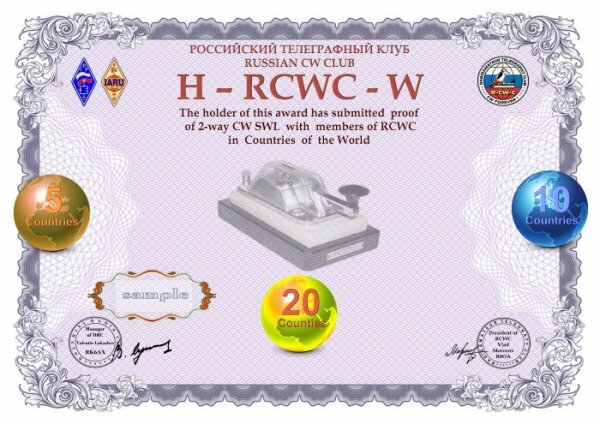 The list of club's members is published on the club's site : http://rcwc.ru/memb. The club's membership of radio amateur,and if he is a club's member - one can find out all his calls(including EX) entering the field "Search club's. 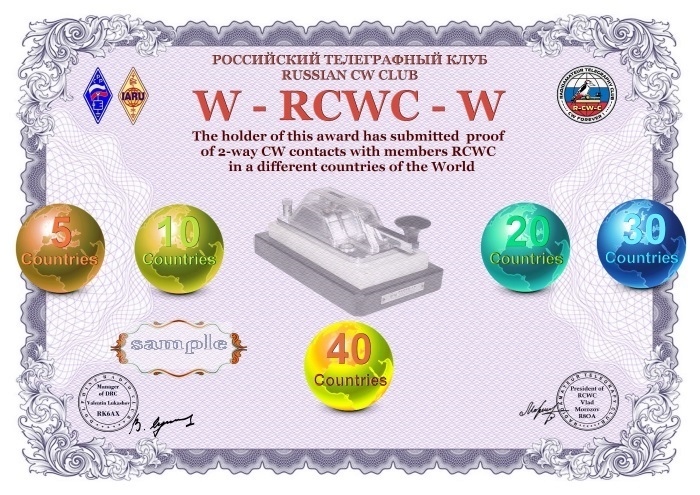 - Diplomas are issued in electronic format for two-way contacts(for SWLs for two-way observations) with RCWC's members from 5, 10, 20, 30, 40, 50 countries. It is enough to conduct only one contact with the country. Belonging to one or another country can be defined by the list of DXCC countries. - The space of time of diploma is not limited,contacts of all radio amateurs of the world,conducted with club's members are valid,beginning with the 22nd of October,2010, the Birthday of R-CW-C club. - Contacts with members of the club do not depend on the date of their joining the club and only one time and if they had more than one call in the list of club's members, with any of his calls. - On getting the application for 10 and 20 countries an applicant is issued and all diplomas of lower categories(on condition that they were not received by him earlier). Previous contacts can go into new diplomas of higher categories.-In the agreement with diploma manager the diploma (one or all fulfilled) can be issued in paper format. The agreement implies the definition of space of making,sums of cost, applicant's prepayment of printing and cost of shipment. The diploma is sent by post to the applicant's address. SWLs get the diploma on the same conditions for two-way observations. Numbering of diplomas in every category (5, 10, 20, 30, 40 and 50) is conducted separately in accordance to entries of applications. Attention: when applying for several degrees of diplomas at the same time, you should submit one application for the degree with the highest priority. All lower degrees are issued automatically. - Applications are accepted to E-Mail: rk6ax@yandex.ru from the moment of publishing of diploma's conditions;? and personal information.One can apply file ADIF as information about contacts. - Your E-Mail (for paper diploma- to add your postal address). The application can be handed in simultaneously with the application for W-RCWC-M, having pointed out through the comma in the head of application the diploma W-RCWC-W as well. In this case one should add the field with prefix of the country according to the list of DXCC to the line about QSO. One should choose only one QSO for every applied country.